I’ve been waiting (not so patiently) to share Clara’s mini nursery makeover on the blog… and today is the day! I technically could have shared this post over a month ago, but I really wanted to wait until after she was born because, as you’ll see by many of the photos below, we have her name on the wall and her initials in 2 places — and I wanted to include those in the pictures without “spilling the beans” before she was actually born! Everything else was repurposed from something I already had in the house or it’s something I borrowed from a friend or relative. Even all the clothes and girly blankets were gifts or hand-me-downs! Walking into the room from the little hallway between our master bedroom and the nursery — looking at the changing table area. 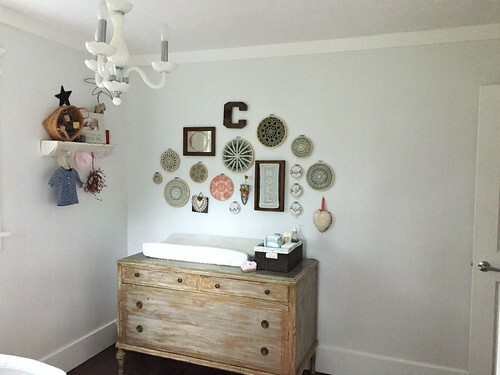 A better view of the changing table area and the collage wall. Each of these doilies and pieces of handiwork were done by one of Dave or my grandmas, great-grandmas, great-great-grandmas, great-aunts, etc. They all have a story and I just love how the collage turned out! Looking towards the crib area from the doorway. The crib, table, chair, and all the bedding is exactly the same as the other 3 kids… however, I borrowed a rock ‘n play this time around, and we’ve already gotten LOTS of use out of it! 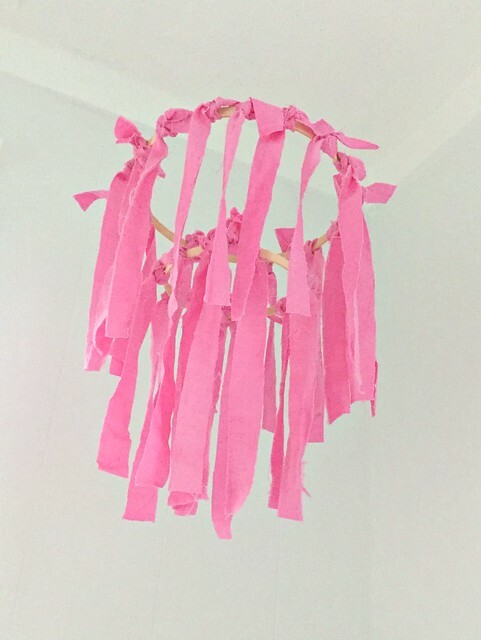 The mobile is the same hoops I used for the boy’s mobile, I just took the wooden tools off and tied leftover pink fabric from dying the pink fabric for Nora’s bedroom. Nothing special, but it was free, it took about 5 minutes to make, and it adds a punch of color to that part of the bedroom. 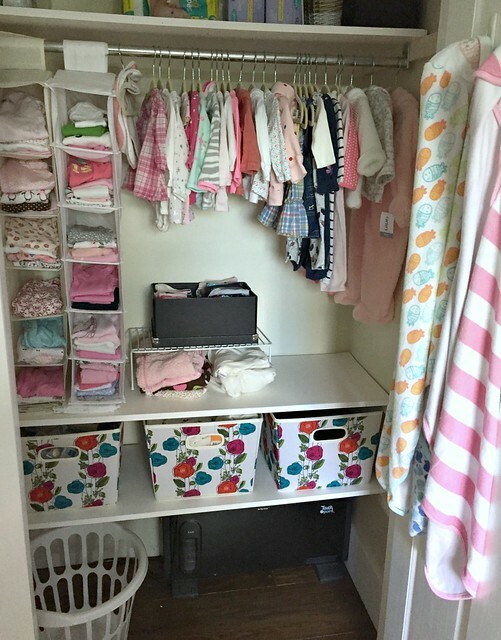 Another view of the crib and chair area — standing by the changing table. Rotating around to the closet area. The oval picture above the chair is my Grandma as a baby. Standing by the crib, looking back towards the closet and the door to the hallway. So that’s the full tour of the smallest bedroom in our house! 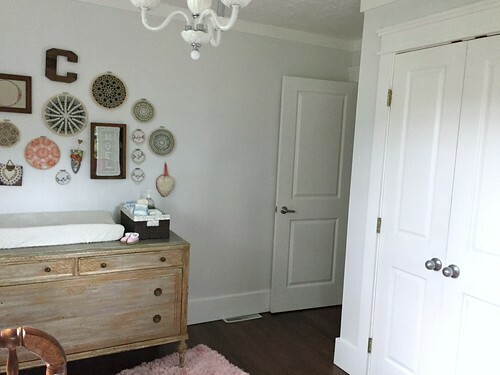 It’s the perfect size for a cute little nursery, and super convenient considering it’s right down the hall from our master bedroom! 1 tired Mama still looks gorgeous 🙂 I love the picture of the 4 children….definitely one to frame. They all came out beautiful!!! Nora looks so grown up! Thanks — and yes, that picture will be framed for sure! The nursery turned out beautiful! I love all the special family touches. How do you keep track of which clothes are borrowed and need to be returned? Do you just keep a list of items and their owners, or do you mark the tags in some way? Congrats again and enjoy your blogging break! Good question — I guess I just remember! Honestly, almost all the clothes were just given to us to use and pass on — so there are just a few I need to return eventually. 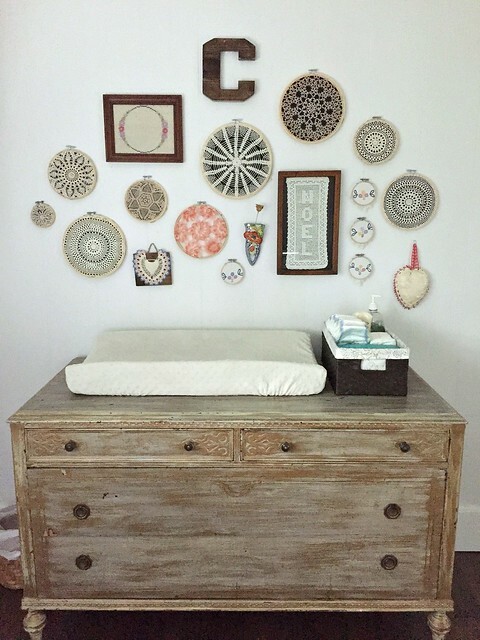 I so love your blog and seeing the nursery transform with each little one! I love your pink rug!! Do you have a link to that specific one?? 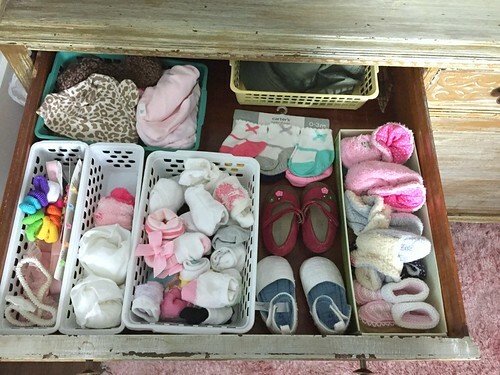 What a sweet nursery you prepared for Clara. 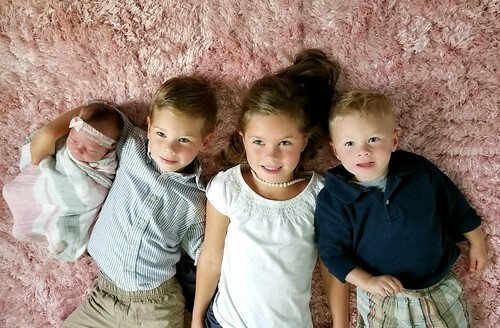 I love, love, love the photo of your four little blessings lined up on the pink rug. Those children hit the jackpot when they got you for their mama. Hope someone at your house is getting some sleep. Thanks so much Kim — that picture is great. I have a feeling it will be a favorite of mine for many years! Hi Andrea! Congratulations for little miss clara.. hows your health? And miss your regular posts as you are blessed with great organizational skills,the way you manage your family ,home and business.you inspire a lot..god bless u. Love the room and your blog! Blessing to you and the beautiful family. I have many doilies and love that you hung them. They look great! I am wondering how you did it. Are they attached to embroidery hoops? Thanks so much and you look great btw!! Not tired at all. yup, just pulled tight between the hoops — it took a few minutes to get them all in the hoops — SO easy! Congrats to your family and welcoming beautiful baby Clara! I bet Big sister and brothers are a big help. Her nursery is well decorated. Wondered where did you score the dresser. I’m sure you got it on a great deal but doesn’t hurt to ask. Forgot to ask, what type are your shades? And yes, the dresser was a garage sale find way back before I was even married. $10!!! 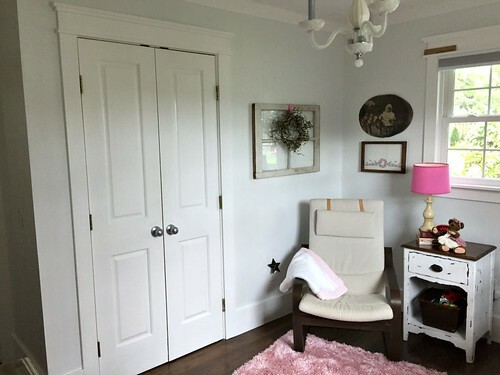 Such a sweet room for your little miss. I love the wall and trim colors, do you happen to remember what they were? You really are gifted with organizational skills! Her room looks fantastic! The Rock ‘n Play was one of our most used baby items. 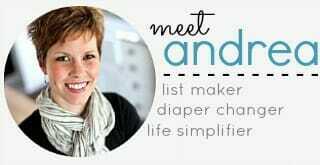 I would put a blanket on my chest to absorb my smell and place it under and around(all of my babies hated being swaddled, so I would just tuck it under their arms and had it loosely on their bellies…but it couldn’t get over their faces) them in the rnp. It helped them to sleep longer, because they smelled me. Or at least that’s what happened in my head. 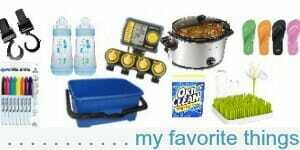 Thanks so much — and yes, we’re really liking the rock ‘n play too! 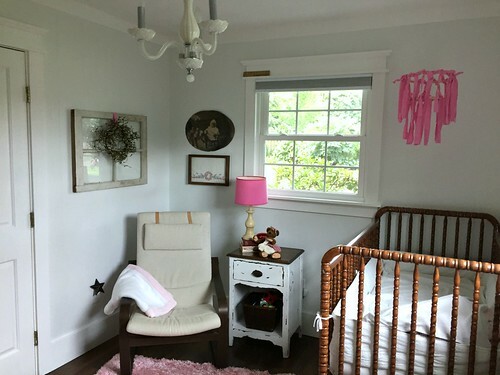 I just love the new nursery, Andrea! The picture with all 4 babies are so cute. Congratulations! Love Miss Clara’s new nursery! No twin bed this time around?!? 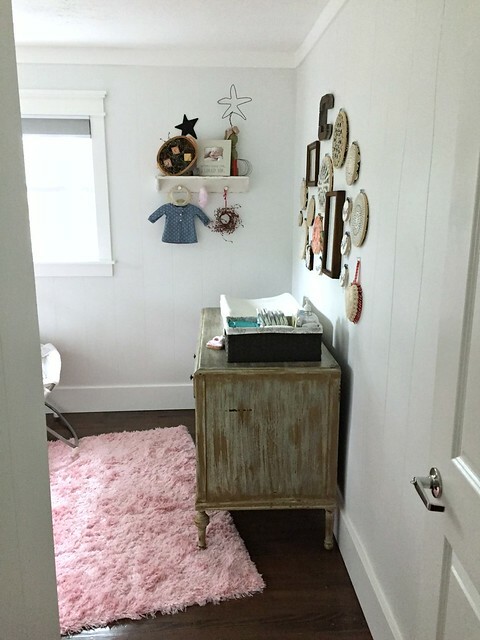 The room is so inviting, and I especially love the doilies on the wall and the pink mobile. I was trying to see how you attached the mobile to the ceiling, but am not able to tell from the photos. The picture of the four children is precious, especially the way Simon has his arm around his baby sister. You look great too! And yes, Simon is so cute! Darling nursery. You have a beautiful family. Praying the tiredness leaves soon. Enjoy, enjoy. You look great…. and the room looks great….and all the kids look great!!! May God give you continual strength and wisdom in all you do. I was one of Chris’ teachers at JCS. Love that he’s a fantastic organist!! Love your nursery. Congratulations on beautiful baby girl! Precious family!! 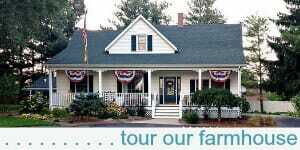 Love how you’re valuing and using those antiques from family. Love your decorating touches. Blessings on you and family! You actually had my sister too (Stacey Wagner). However, Chris Dekker is a different Dekker. My husband is Dave. We know Chris though as I grew up going to church with him. Congratulations on your sweet new daughter. It would be fun to hear the stories behind the handiwork pieces. Well I don’t know all the stories — more just WHO they are from and how I ended up with them. Either way, it was really fun to put them all together and to have something sentimental from each side of our family in Clara’s room! VERY very cute girl nursery setup. Thanks for sharing, so fun to see! And a huge congratulations on the precious new family addition! Are the walls white or light gray? Love the room! They are white — Frost actually (from Behr!) It’s my favorite “white” color and we’ve used it for many rooms in our home! Great, thank you! I took your advice on buying the Behr gallons during the Labor Day promotion & I’ve been trying to figure out what shade of white to tint them to. Love your blog, thanks for sharing with us! Welcome Baby Clara! You have been blessed with a wonderful home and family. Andrea, I miss your daily posts but am so “proud” of you for taking a break during this busy tiring time. You’ve chosen what is best for now. So true – I’m missing your daily posts. But Lori is right, you’ve chosen so well to take time off! Enjoy these precious new weeks with your baby – that time flies so fast! Congratulations – may God bless you as you raise your precious children! I’ll definitely be ready to get back into the swing of regular posting soon! Thanks so much Lori! I’m also excited to get back to regular posting soon. The break is great, but I miss the routine! 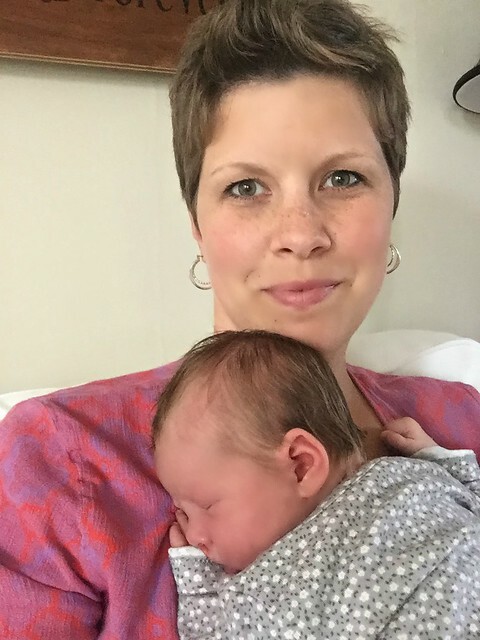 Congratulations on little miss Clara Jo! I’ve been waiting not so patiently for this nursery tour, it’s beautiful! You always do such an amazing job! Off topic but I was wondering what the cups you are currently using for the kids are? Brand and where you got them please? As for cups, we actually don’t use sippy cups anymore. We have an Aladdin brand water bottle for each kid and then we use these Silicone lids and straws at meals or when we’re out and about. Very, very nice! Great job! She’s beautiful! God bless your dear family!